A couple of technical ? 's for "Team Green"
Discussion in 'nVidia Flavor' started by The Cobra, Feb 10, 2019. Hi Team Green [H]’s. I have a few questions since my five-year hiatus from Nvidia cards on my desktop. I recently upgraded from a pair of AMD Vega Frontier Edition cards to a pair of 2080s. No issues or anything installing the new cards as it went off without a hitch and a tad boring since it was a piece of cake. But I do have some technical question about them after being away for so long. 1) PhysX: I know that PhysX is still around and used in a lot of gaming engines nowadays. But I have never really thought of it as groundbreaking…even when I had an original PhysX card back in the day. In the Nvidia control panel, I used to be able to split PhysX rendering across both cards when running in SLI. Now I see you can run it across one card or the other or the CPU. Was this feature removed? Just curious…. 2) What is a program that can be used to unlock the hidden features to in the drivers. What is currently used to achieve this? 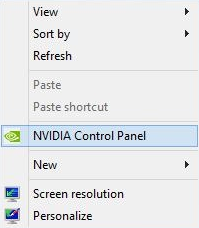 5) When launching the Nvidia control panel, is there anyway for it to appear at the top of the list instead of the middle when clicking on your desktop properties? I used SLI since the 8800GTX up through the GTX 970 and I never had the option to split PhysX across both cards. Just leave it on Auto unless for some reason it is choosing the CPU. If it is choosing the CPU then pick the first card manually. NVIDIA Inspector, but it hasn't been updated in a couple years. Some of the flags may cause issues with newer drivers. I highly recommend finding a guide to know what all the driver flags do. You do need this if you want to try and enable SLI in games with no official support. I wouldn't give my hopes up. As far as I know the codes are just tied to the hardware, so the codes you have can be sold to someone who also has a Turing card (2060, 2070, 2080, or 2080 Ti). I used a code for BFV successfully that I received from another use who also has a 2080 Ti. You mean moving this up? I don't think so... If you have GFE installed you can also right-click on that in the system tray. I also believe there is a way to create a shortcut to it that you could pin to your taskbar if you need quicker access to it. Legendary Gamer and ManofGod like this.